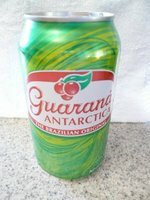 I really don't know what Guarana Antarctica is going to taste like... but it sounds really refreshing. The nice lady that rang this up for me gave it rave reviews, "like a sweet ginger ale" she said. It comes in a green swirly can, and under the name of the drink it reads, "The Brazilian Orginal." I can only assume this is good at the moment, so let us open it up and find out for reals. Well it is refreshing... and she's right (sort of). The closest thing I've had in flavor to this is Vernor's Ginger Soda. This is made with chemicals, but also has guarana in it. The last sentence should be a bit obvious due to the fact that Guarana is the name of the soda. It's less fizzy than ginger ale, and a little more sweet. The crisp flavor, which hints slightly of apple, is also nice. For some reason when it's in my mouth though, the inside of my lips stick to my teeth; that's a little odd. I don't think this is all that good for the enamel. While I enjoy the flavor, the adverse effects it's having on my teeth is offsetting.